The Polymer Film Making equipment is ntended for preparation of cast Films or sheets from Polymers like LDPE, HDPE, PP, POLYSTYRENE etc. To prepare the film or sheet from granuals or from small pieces it is necessary to heat the sample & simultaneously apply pressure. Suitable dies are to be use to obtain required thickness depending upon applications. 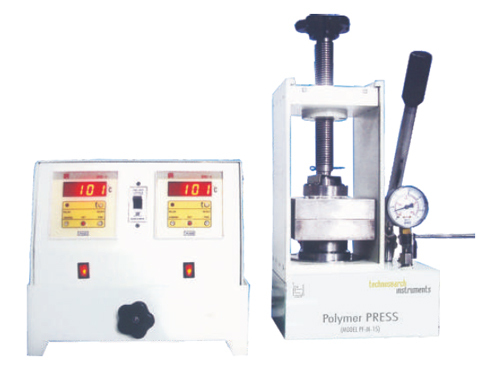 Temperature & pressure conditions can be set as per the required sample. Power 230 V, 50 HZ. → To prepare cast films for studies in IR/FTIR Spectrometers. → To prepare cast sheets for measurement of physical properties such as tensile strength, elongation etc. 15 ton Laboratory Hydraulic Press. Heating arrangement with temperature controller indicator & necessary for water circulation for cooling plumbing.